I'm uninspired today. Can't think what to write about. I don't really feel snarky, and I can't get up any righteous rage about the idiot politicians and their earnest attempts to ruin the economy in the mad pursuit of re-election. Celebrities aren't doing anything interesting. My family is not providing its usual loopy inspiration. 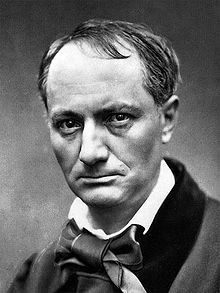 Fortunately, this blog's muse, Charles Baudelaire, has provided relief in the form of commiseration. Even moody French poets suffer from paucity of inspiration sometimes. Chuck wrote about his own drought of creative juices in the poem "La Muse Malade" - "The Sick Muse." And since I'm suffering from the same thing, I'm just going to nick his verse for today's post. Stealing is the sincerest form of flattery. ﻿There are a lot of different translations of "The Sick Muse" floating around. I like this one best; you can check out some others, as well as the Frenchie original, here. "I hope my muse returns tomorrow" dance.